"I have in this war a burning private grudge against that ruddy little ignoramus Adolf Hitler," Tolkien wrote to his son Michael three years later, by which time the war had reached a new height. "Ruining, perverting, misapplying, and making for ever accursed, that noble northern spirit, a supreme contribution to Europe, which I have ever loved, and tried to present in its true light." He had already faced German forces in combat during his service in World War I, and had almost became one of World War II's codebreakers after the British Foreign Office's cryptographic department brought the possibility to him in early 1939. He did not, in the event, participate directly in the conflict, but he did leave behind an uncommonly eloquent paper trail documenting his stance of unambiguous antipathy for the Nazis and their ideology. For more such fascinating perspectives vouchsafed to history through the mail, do have a look at Letters of Note: An Eclectic Collection of Correspondence Deserving of a Wider Audience, the brand new book from the site of the same name. Tolkien's letter above comes from it, as do many of the illuminating missives we've featured here before — and, without a doubt, those we'll continue to feature in the future. Want to download a Tolkien audio book for free? Start a 30-day free trial with Audible.com and you can download one of his major works in unabridged format. You can keep the book regardless of whether you continue with their great program or not. There are no strings attached. A brilliant reply from one of the most gifted writers of the 20th C. Thanks for sharing it with us. I think this post was wasted. Tolkien was, of course, not racist and hated the Nazis, but this was already well understood (even Wikipedia deals with this at length). What Tolkien’s position should show us is that his hatred of Nazism went beyond the current pop culture-informed assumptions. 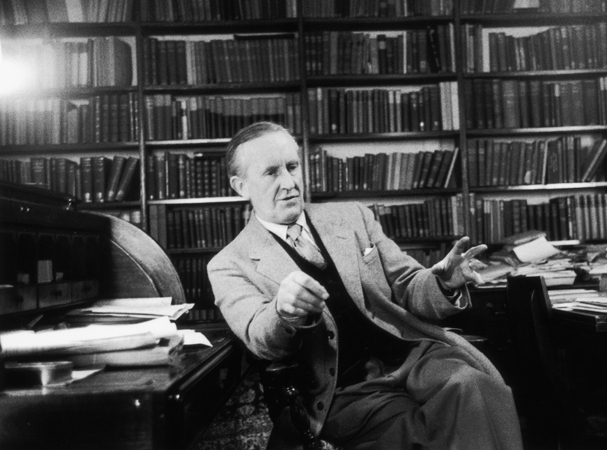 Tolkien knew, as we should, that the politicized, warped, Manichean “choice” between the construal of Germanness as GOOD because it is war-like and white supremacist (the Nazi’s view) vs. the construal of Germanness as BAD because it is war-like and white supremacist (the Anglo-American view), is a false choice. Germanness and the connotations around it cannot and should not be so reduced. Tolkien saw that the issue is more complicated and, while there is no reason whatsoever to promote anything German as being naturally superior, that which derives from a Germanic sensibility can be wonderful, but is seen today through a very distorted lens (which makes it easy to hate or dismiss). That is the important lesson here: we love deriding the Germans, though cheaply and from misunderstanding. Tolkien was decent and sophisticated enough to see, even though he was immersed lifelong in the doctrines of the British Empire, that our very correct rejection of the values of Nazism should not then, wrongheadedly, extend to a rejection of Germanness. le reddit army is here! Cody, you are off base and out of context. This was before WW2, so it was before he would have been so staunchly anti Nazi. This is before anyone but german jews were anti Nazi. Ragemojo, I assure you, the Nazi’s were not uniformly well regarded before WWII either. The NSDAP (the Nazi’s) were well understood to be both totalitarian and expansionistic. Tolkein’s politics were largely formed during his experiences during WWI. He was pro agrarianism, anti industrialization, anti-authoritarian. He found the tendencies the Nazi’s exhibited in the 30’s to be worrying and orc-like. I have always been (since I first read it in 1973 anyway) troubled by the evident racism in Lord of the Rings. It really shocks me to hear people say that Tolkien was not racist OF COURSE (I add emphasis to the shocking part of course). Racism is not necessarily uttered or practiced with the over-the-top rantings of a Hitler. Utterances may well seem racist in one era or culture that would seem tame in another. For example, Tolkien’s letter refers to the Jews as a gifted people. That strikes me as a racist remark. I don’t want to hold Jews higher than anyone else any more than I want them to be treated worse than anyone else. Throughout the Lord of the Rings it seems to me that a person or creature’s alliance with good or evil is frequently a matter of race. Sauron’s dark-skinned southern allies with their giant beasts or the orcs for that matter never show any tenderness. They are incapable of finer feeling because finer feeling is the birthright of the attractive elves. Even the hobbits seem to “know their place” and to rank themselves as a people below the station of elves. How is this not racist? I could understand if you would say that there are signs that Tolkien is not racist, but to say OF COURSE is to dismiss all the signs that he ranked people and creatures by race. perhaps you should back it up a bit, and realized that by the time Tolkien was confronted with this request everyone knew the environment that Jew’s were confronted with in Germany. Tolkien was taking that moment to poke the hornets nest by lifting up the Jewish race when the subject of the inquiry was for him to distant himself from them. Mayhaps, and I only suggest this as something to be considered…that you are projecting your own insecurities on Tolkien’s intentions. In his writing’s Americans could be Orc’s just as much as the Germans could have been…he was anti-industry…which is what the Orc’s represented…progress through technological innovation. Not a race being re-imagined as foul and craven, no…but representative of what he found to be wrong and destructive. Sadly, too many people think like you do and render Mr. Tolkien’s writing little more than cudgels to beat your own drum with. Great stuff! I love Tolkien’s unwavering response. Zorg, the Jews are a gifted people. They constitute about .05 percent of humanity and maybe 2 percent of Americans, yet 20 percent of Nobel laureates are Jewish, about half of the chess grandmasters, etc. etc. etc. It is not racist to say that because Jews are not a race, they are a religio-ethnic culture which includes many (gifted) converts. Nonetheless, Sheerahkahn’s reply that Tolkien was taking a stab at Nazi pride, is correct. You know you can’t really write a piece on one of the most gifted writers, tag the article under Literature and then draft a sentence with “had almost became” – It’s a sin. Tolkien was anti-German and his reply is childish and a rant. The German publisher wanted to publish a German version of the Tolkien books. The German people loved this mythological stuff. All the publisher did, in typical German orderly fashion, was to ask a legal requirement which was necessary to ask to publish books in Germany. If Tolkien was non-Aryan, it would pose a problem to mass publish this book for reading in Germany. Tolkien’s reply was a childish rant. He should have replied “Yes” and been more sensible and think of the German readers who would be denied his work. Of course he didnt care because he despised Germans are subhumans. Ironically he was more racist than Nazis here. Like the huge majority of Britons and Americans back in the day he didn’t have much hatred for Germans despite having a lot of reasons for despising them. He seemed to have the same rightful ire against Himmler’s attempts to rewrite German history that most intellectuals who knew one or two things about real history had at the time, combined by his despise of Industrialism which, the Nazis technically agreed with (Blut und Boden and all that trash), which didn’t make him more hateful of the Germans than it did of the British, French and even Americans. As for racism I cannot say, he was South African after all and in a time where even the Americans didn’t let blacks use the same services whites did, so he probably didn’t have many progressive views on race relations compared to nowadays, that said with the Hobbit and other books he seemed to believe strongly on Herzt’s Zionist ideas, so at least we know he wasn’t as antisemite as most of his contemporanies. Lazlov, your statement is not reflecting of an accurate understanding of Tolkien’s life, history, and professional work. Tolkien was proud of his Germanic heritage, keeping his German surname in a time when many English people of German descent were altering their surnames. He adored Germanic literature, myths, and languages, working nearly exclusively with them in his research and scholarly publications. His fantasy literature drew heavily from the Germanic mythos, especially “The Lord of the Rings” and “The Silmarillion.” Though he fought against German soldiers in WWI, he had no special hatred of Germans. He hated Hitler and the bellicose and racist policies of the Third Reich, but that hatred did not extend to the German general population or culture. Your statement of 12/6/14 is simply incorrect. We’re not talking about your own ethnocentric and wishful thoughts in the matter, but about Tolkien’s. What you’re saying is already a preconceived evidence for most if not all of us. There was a context for the german people to become, quite understandably, highly sensible psychologically, hence “intellectually malleable”. More generally and as for many other countries in the World, especially today in our so-called (corrupted) democracies, the acts of some idiots at the Helm don’t necessarily reflect the underlying potential and reality as a People. Get over it. Please don’t project your own fears and ethnocentric paranoia on such discussion, it’s useless and it looks like some bait-and-switch throwing away the topic (rude). In short, you’re saying «It’s more complicated»… Of course it is when one’s identity is involved! Like a mix of emotions and contradictions one needs to rationalize in some way.. My suggestion: don’t try, let it be in the past. We can analyze how those methods to condition the masses were put at work, make parallels with today for that sole matter, but for the rest it’s part of our human experiences now: another proof that we’re the sole specie engaged into a somewhat “Extra-Biological” Evolution, involving our brain (relatively huge which is quite unique among other living species).